The 11 acres of land on which the resort sits was originally part of the Grafton Cocoa Estate. Following Hurricane Flora, in 1963, the owner of the Estate, Eleanor Alefounder, took to feeding the wild birds, whose habitat had been badly damaged. In her will, she bequeathed parcels of land to members of her family on the condition that the 260 acres of forest which adjoins the Stonehaven property remains a wildlife sanctuary. Arne Hasselqvist, the architect/builder who was responsible along with the landowner, Lord Glenconner, (Colin Tennant) and theatre set designer Oliver Messel for the development of Mustique, developed a design that referenced the 18th century French occupation of Tobago. He specified materials such as andiroba and greenheart hardwoods from Guyana, oil-rubbed bronze hardware from Peru, granite and marble countertops from Brazil and floor tiles from Italy. There are many wonderful stories of ‘happenings’ during the construction of Stonehaven, including several ‘visits’ from the original owner, Eleanor, who was seen riding her white horse bare back through the site with her long hair flowing! 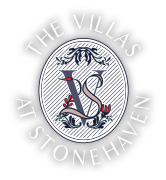 Finally, in 2000, after three years of construction, Stonehaven Villas opened for business with a champagne celebration. Among the many invitees was Eleanor’s brother ‘Uncle Max’ who had sold the parcel of land to Stonehaven. Sadly, two weeks after this event, Arne Hasselqvist, designer and a co-investor died tragically in a fire in the Bahamas where he had gone to start his next project. All villas have guaranteed panoramic ocean views. Guests have the option of breakfast prepared by their housekeeper each morning. We can, on request, arrange to shop for the items. Check-in time is 2:00 pm and check-out time is 12 noon. We will make every effort to accommodate early arrival and late departure requests depending upon occupancy levels. All villas have a safe for storage of valuable items. Cell phone coverage is available throughout the entire property; Guests are advised to check with their carrier before arriving in Tobago to fully understand roaming and international fees. Free Wi-Fi is available resort wide. Dress code is resort casual throughout the day; elegantly casual attire is requested after 7:00 pm. Electricity: 110-120 volts, 60 cycle A/C. A minimum of 20% deposit of your total villa rental is required to confirm your reservation, with the full payment due thirty (30) days prior to arrival date. If the booking is made within thirty (30) days of your arrival, full payment is required at the time of booking and is not refundable. All reservations are valid for a full refund if cancelled no less than thirty (30) days prior to scheduled arrival date. All cancellations made after the aforementioned period are non-refundable. A service charge of 10% is added to bills and distributed amongst the staff. Guests are welcome to provide additional gratuities at their discretion. At check-in, if the number of person differs from that stated on the initial reservation, guests will be charged at the prevailing rate of the day. Special advance purchase rates may require full prepayment at the time of reservation and are non-refundable.